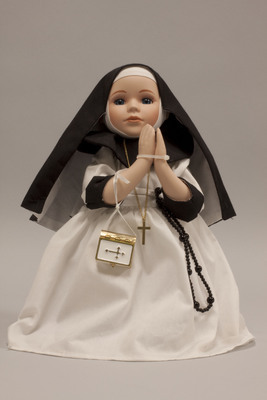 "Doll wearing habit worn by Dominican Sisters"
Doll is kneeling in prayer and wearing a habit worn by Dominican Sisters. The Dominican Sisters were first founded in Prouille, France in 1206. The dress is white, with black cuffs on the sleeves and a black veil and collar. The doll has a black rosary hanging from her waist, and a small bible with a white and gold-colored metal cover hanging from a white ribbon around her right arm. She is wearing a metal cross on a metal chain around her neck.